Low back pain seems to be a common problem among Americans. So much so that the National Institutes of Health say about 80% of Americans will experience back pain at some point in their life. 80%?! Yikes! 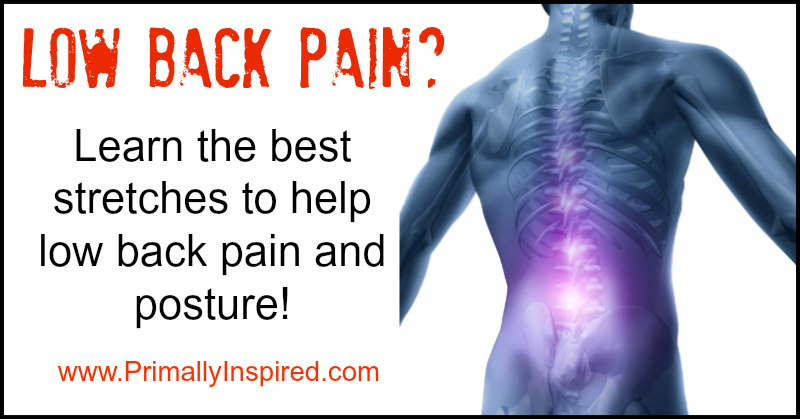 So what is causing all this back pain? Most doctors will agree that poor posture is the main culprit and specifically poor posture when sitting. Americans spend so many hours a day sitting. This makes our hip flexors and hamstrings very tight and puts an extreme sway in our lower back causing back pain. Plus the older we get, the more our muscles tighten and shorten. This causes less range of motion in our joints, which leads to poor posture. 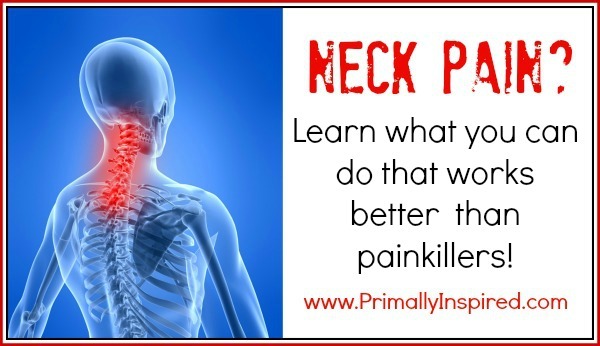 Not only that, but poor posture and tight muscles puts us more susceptible to muscle, tendon and joint injuries. Postural awareness and stretching tight muscles are the two most important things you can do to manage back pain and prevent it from happening. Dr. Alexander Vaccaro, MD, PhD, and a spine surgeon at The Rothman Institute in Philadelphia agrees and says good posture with proper alignment can alleviate back pain. 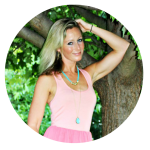 Today I will show you yoga poses and stretches you can do to help your low back pain. Stretching and yoga poses are an excellent way to release tension and tightness in the muscles. Stretching these tight muscles improves circulation of blood flow to the muscles and joints. With this circulation brings healing nutrients to our cells and removes waste byproducts. Stretching also keeps your body in better alignment and counteracts tight muscles and muscle imbalances that cause poor posture. The muscles that we will stretch in the yoga sequence below are the main muscles associated with poor posture and low back pain: hamstrings, hipflexors, glutes and the back muscles. Remember, if you have serious back pain, it’s important to see a doctor, chiropractor or specialist to help you. Lie with your back down on the mat, heels on the floor. Gently grab your right knee with your hands and bring your knee as far as you can comfortably go towards your chest. Keep the other leg stretched out. If this is too difficult, you can bend that knee, too with your foot on the floor. Breathe deeply and hold for at least 30 seconds. Repeat on the other side. When you have streched both sides out, grab both your knees to your chest and gently rock side to side. This is a great, gentle massage for the low back. Lie down on your back and bend your left knee. Cross your right ankle over your left knee. Hold behind your left thigh and gently pull your knee to your chest until you feel the stretch in your glute and outer thigh. Go only as far as you are comfortable and remember to breathe deeply. Hold for 30 seconds and then repeat on the other side. Grab a band or rolled up towel/shirt. Lie on your back with your knees bent, feet flat on the floor. Wrap a band or towel around your leg. Extend that leg and pull the band towards you until you feel the stretch in your hamstrings. Only go as far as is comfortable for you. Breathe deeply and repeat on the other side. Lie down on your back. Bend your left knee and gently cross it over your right leg. Make sure to keep both shoulders on the floor and only bring your knee over and down as far as comfortable. Breathe deeply and hold the stretch for 30 seconds. Switch legs. Sit up straight and stack your legs on top of each other, as pictured. Your right ankle should be directly on top of your left knee and your left ankle should be stacked right above your right knee. Breathe deeply and hold this pose for 30 seconds. Switch sides. Lie on your stomach with your hands beside your shoulders. Gently press up until you feel a stretch in your lower back. Keep your elbows bent. Hold for at least 30 seconds as you breathe deeply. Get on all fours with your hands directly below your shoulders and your hips below your knees. Arch your back as far as you can comfortably go like a cat stretching their back. Hold for a few breaths. Then go the opposite way by moving your tailbone and chest up as far as you can comfortably go. Hold for a few breaths. Keep going slowly from cat to cow position about 6-8 times. Get on your hands and knees. Sit your tailbone back towards your heels. Stretch your arms forward and place your palms and forehead on the mat. Breathe deeply and hold the pose for at least 30 seconds. 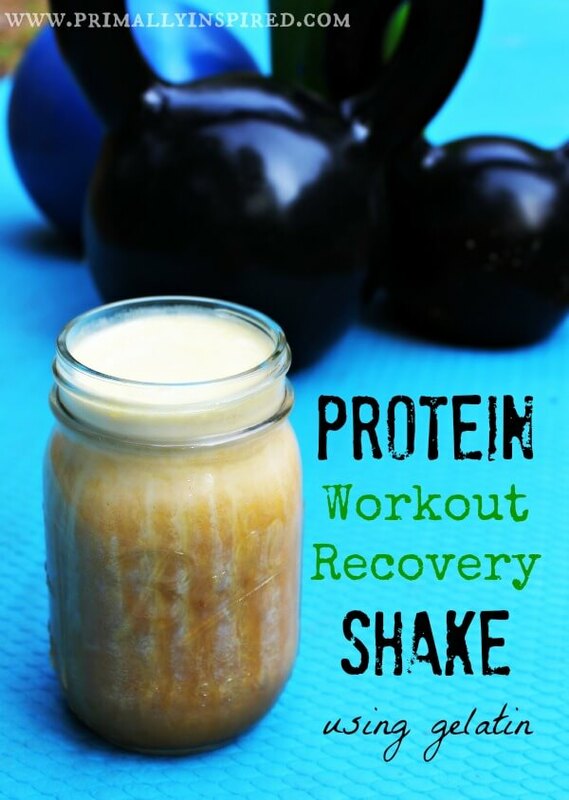 Ditch the protein powders and try this real food, workout recovery protein shake with gelatin! 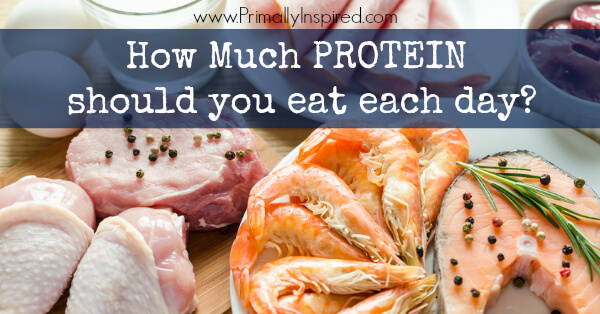 Every ingredient aids in muscle rebuilding and recovery! These are great! I even showed it to my chiropractor and he said right on and would recommend the same ones. I love your site and am so glad you posted these stretches. 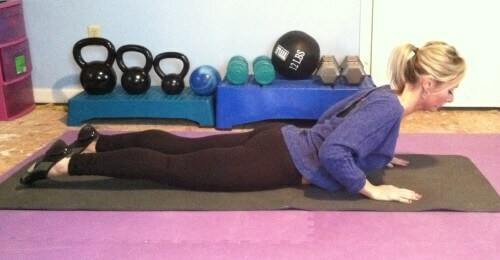 I will continue to do this one and the rounded shoulders stretches. I really do notice a difference after I do them! Valuable information. Lucky me I discovered your website accidentally, and I’m really glad I did. I love the yoga stretches and other workouts. Thank you. 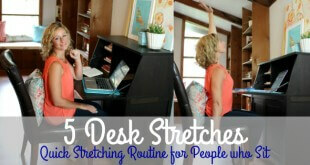 These are wonderful stretches! I have been doing them since you posted this and my chiropractor said my posture is much better. My back pain is so much less as well. These really work! Thank you so much! Living in Vegas, I found this blog by following a link from Twitter. Very Glad I did. 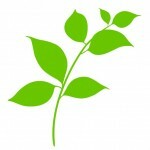 Interesting topic, and great site. Keep up the Excellent Work. Your dog is cute! 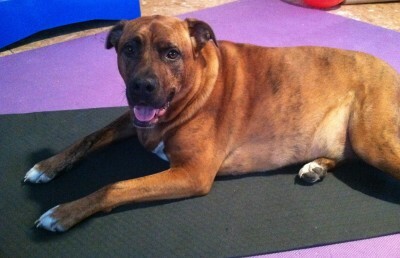 My little terrier Lentil does the same thing when I break out the yoga mat! Great post. Hope these yoga postures help in elimination of the backache. 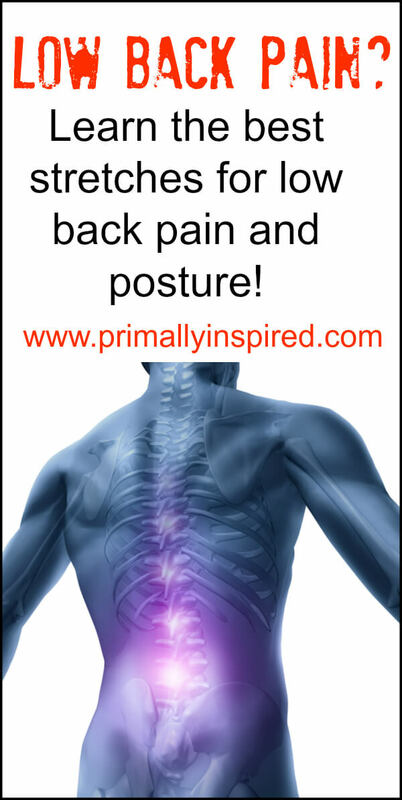 Thanks for also sharing the images they help to understand the posture better. I tend to have daily pain in my lower back due to scoliosis. I’ve been looking for good stretches that target that area. I’m excited to give these a shot. Thank you for this! I also appreciate you using the shirt go demonstrate how we don’t need to buy anything to do this. I commute, sit at a desk, commute home and have very little time when I get home for anything other than my family and to-do list. These are things I Can do at work, on my break or over lunch or after everyone else goes to bed. Thank you for making this simple and easy to do. Hi! I have bad posture and low back pain. Which exercises should I start with? The rounded shoulders or the low back pain one? The low back pain one! You are so pretty and inspiring! Thank you for the stretches I’m going to do those first thing in the morning when I get up. Your dog is so cute too. I have a big lug of a dog and he owns parts of my home too or should I say, Our Home! Thank you so much, Kat!! 🙂 I just adore dogs, too. This big boy makes me laugh every single day! Thank you! These are great! Love your websit! On the ankle to knee pose your written directions don’t quite match the picture. The written instructions say the left ankle should be stacked directly over the right knee but I believe is should be under the right knee as shown in the picture. Thanks for this informative article. I love these stretches and can attest that they work wonders. 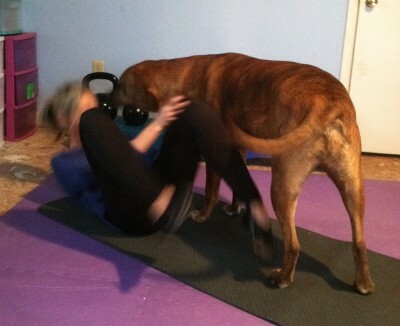 Kelly, these stretches have completely gotten rid of my lower back pain. It only took 2 sessions to see dramatic results, and by session 4, I was completely free of pain. Thank you so much for all that you do to help us on this journey towards greater health!! Sarah, that is so great to hear!! So happy that you are getting relief! Oh I am glad I stumbled upon this site. Though the last activity was like last year, still I want to share that this has helped with my back pain as well. Good job for people behind sites like this that aid in people’s troubles, whether health or in life itself. Awesome site! I’m glad you listed the “lying knee crossover” stretch – that one was the game changer for me! It stretches out my glutes so nicely and helps them to stop pulling on my lower back, which apparently is what was causing my pain all along, and I think may be what’s causing back pain for a lot of us. Many of us have tight glutes nowadays because we’re so sedentary, or that’s the theory at least.